Yes, 'tis quite a shock for a Monday morning, but it turns out the dual-booting Fujitsu LOOX F-07C smartphone is indeed legit. According to NTT DoCoMo's preliminary spec sheet, this 7.69-ounce landscape slider handles both Symbian and Windows 7 (Home Premium, 32-bit Japanese edition) with its 4-inch 1,024 x 600 LCD (that's 297ppi right there! ), along with a 1.2GHz Intel Atom processor, 1GB of LPDDR400 RAM, 802.11b/g/n WiFi, 32GB of eMMC disk space, and expandable memory via microSDHC. You'll also find a 5 megapixel autofocus camera with face detection on the back, coupled by a VGA front-facing camera. Of course, the main concern is how the battery life fares here: we're told that in "mobile phone mode" you get up to 600 hours of generous standby time and up to 370 minutes of 3G talk time; whereas in Windows 7 mode you'll have to make do with just two hours, and then you're forced into mobile phone mode when the battery level is low. If you're itching to get yourself an eccentric F-07C, then watch out for its launch in June or July. Full list of specifications and press release after the break. Update: ASCII's just posted a few real-life shots of this device, and mentions a retail price of around ¥70,000 ($860). Oh, and there's HDMI-out via a USB adapter. Update 2: Akihabara News has a hands-on video -- check it out after the break, and be sure to take a gander at its photos as well. TOKYO, JAPAN, May 16, 2011 --- NTT DOCOMO, INC. announced today its 2011 summer lineup of 24 new mobile devices for launch on or after May 20, including nine smartphones, the largest and most diverse collection of smartphones ever released by DOCOMO, plus a wide variety of feature phones compatible with DOCOMO's i-mode™ mobile Internet platform, as well as mobile Wi-Fi® routers for DOCOMO's Xi™ (read "Crossy") LTE extra-high-speed service. The smartphone lineup offers user-friendly features for tethering, mobile-wallet (Osaifu-Keitai™) and infrared-based data exchange, plus downlink speeds up to a theoretical maximum of 14 Mbps starting from early June. The lineup also boasts the world's first wirelessly chargeable smartphone. All Android™ smartphones, including the globally popular Xperia™ and GALAXY models, are preinstalled with Android 2.3. Numerous i-mode services and technologies available for smartphones, including Area Mail™ disaster information service, i-channel™ push-based information service and Melody Call™ ringback tones. Smartphones offering enhanced convenience and operability thanks to the new "docomo Palette UI" feature for easy sorting, searching and management of apps. Eleven high-spec, i-mode-compatible feature phones equipped variously with 3D screens for dynamic viewing, HD-quality cameras and much more. The i-motion™ video-clip distribution service for FOMA™ 3G feature phones now offers 50 MB capacity for both long and high-definition video. Batch downloads of various content are possible with DOCOMO's new "content package" service. Two mobile Wi-Fi routers compatible with DOCOMO's Xi-brand LTE service, offering fiber-optic-level mobile connectivity for wireless devices. LTE service will include Japan's six largest urban metropolises by July and other large cities including prefectural capitals by March 2012. Android smartphone with 8.0-megapixel 3D twin cameras. LCD panel and image processor based on AQUOS technology for high-resolution images. Equipped with a world's brightest display*. Body is 9.5 mm thin and weighs only 112 g. Interchangeable rear cover comes in 3 colors. Android smartphone with 4.3-inch SUPER AMOLED Plus display. Powerful 1.2 GHz dual-core CPU enables fast app launches and stable video. Waterproof Android smartphone in world' first 7.9-mm body**. Mobile wallet, infrared-based data exchange and one-seg TV. Premium model designed with appliance brand amadana. BlackBerry® Bold™ 9780 June or July Featuring the new BlackBerry OS 6.0 for faster, richer web browsing. Android smartphone with mobile wallet, infrared -based data exchange and one-seg TV features. 4.2-inch "Reality Display" delivers brilliant, crystal-clear images. Android smartphone features Bright Color Liquid Display and voice-enhancement capability for extra-clear audio. Designed in collaboration with luxury luggage brand Globe-Trotter. Stylishly beautiful Android smartphone with 4.3-inch touchscreen. Screen position of keypad and touch-speed selector can be customized for easy one-hand operation. AQUOS PHONE™ f SH-13C July or August First smartphone capable of wireless charging*** merely by placement on top of a pad. Compact body is both dustproof and waterproof. *As of May 13, 2011, according to LG Electronics Japan. **Among 3G mobile phones as of May 13 2011, according to NEC CASIO Mobile Communications, Ltd.
***Requiring no other accessory, and among smartphones of IEC-member/Taiwanese makers as of May 15, 2011. Dust/waterproof phone with combined mat/glossy body scheme. 8.1-megapixel camera, over 2,000 preinstalled Deco-mail™ pictograms/animations, and various mail-decorating functions. 11.8-mm waterproof phone with 12.2-megapixel camera for shooting Full High Vision video. Prism glass illumination and beautiful jewel-like design features. Elegant body embedded with Swarovski-brand white crystals. 13.2-megapixel camera features synchronized operation of quick-action auto focus and shutter release. Waterproof body with 12 color variations for personalized styling. Equipped for mobile wallet and one-seg TV. Preinstalled with Snoopy screensavers and wallpapers. Elegantly simple phone with four dedicated keys for quick access to favorite functions/contacts. "Clear voice" function for enhanced audio. Dust/waterproof body with 3.4-inch Full Wide VGA mobile 3D touchscreen. 16.1-megapixel camera shoots Full HD video. Beautiful function-linked illumination on side edge. High-spec waterproof body with responsive touchscreen. Vibrant 3D experiences on large 3.5-inch rotating screen. 16.3-megapixel camera with CMOS sensor shoots Full HD movie. First EXILIM™ Handset for DOCOMO. 16.3-megapixel camera shoots Full HD video. 3D screen for enjoyment of dynamic images and games. LUMIX Phone™is world's first phone with optical anti-shake*. "My Color Mode" enables easy creation of highly artistic photos taken with 13.2-megapixel camera. *For photo/video functions as of May 13, 2011, according to Panasonic Mobile Communications Co., Ltd.
12.8-mm waterproof phone with security features such as fingerprint sensor. Business-support features including business card reader linked to address book and "whiteboard photo" mode. N-05C June or July Waterproof slider phone with quick-shooting 8.1-megapixel camera equipped with highly sensitive lens. Professional/personal tool equipped with Wi-Fi connectivity, various dictionaries, etc. Stylish mobile Wi-Fi router for FOMA 3G/Xi LTE services. Robust battery lasts up to 6 hours for Xi and 8 hours for FOMA. Works simultaneously with up to 10 devices. Mobile Wi-Fi router for FOMA 3G, Xi LTE, WLAN and wired LAN. Connects to 6 devices. Preinstalled with Network Attached Storage (NAS) and media server function. FOMA USB data terminal with protective cap. Stylish design and weighs just 25g. 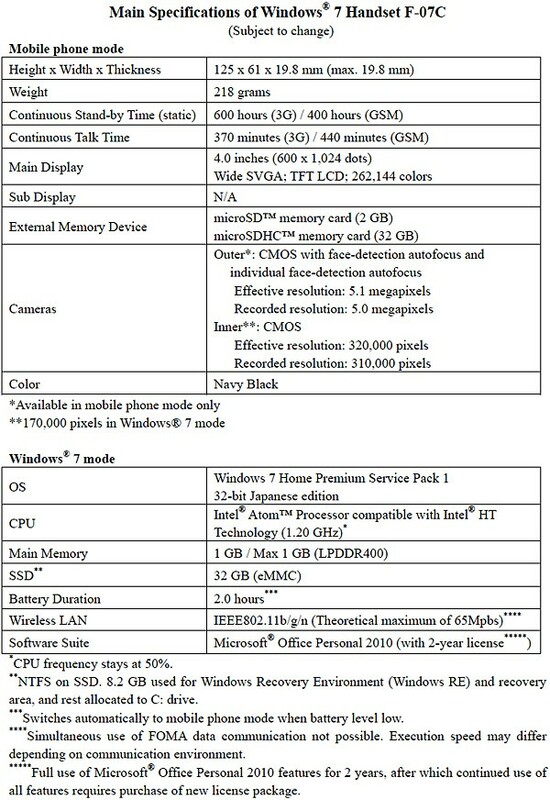 World's smallest Windows 7 PC (Windows 7 Home Premium 32-bit Japanese edition)*. Enhanced security and practical mobile-wallet functions preinstalled. USB/HDMI cradle optional. *According to Fujitsu Limited as of May 13, 2011.